Today’s update looks at a variety of information sources that highlight recent developments relating to the U.S. farm economy, including variables associated with farmland values, agricultural prices, and farm income. An update on March 23rd from the Federal Reserve Bank of Minneapolis stated that, “Farm incomes and capital spending continued to decrease, according to lenders responding to the Minneapolis Fed’s fourth-quarter (January) agricultural credit conditions survey. Falling incomes also led to decreased loan repayment rates, while loan demand, renewals and extensions increased. 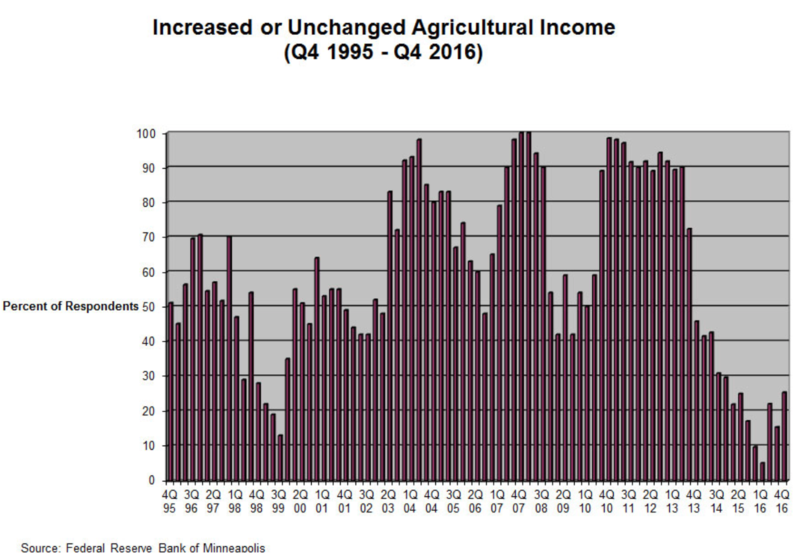 The Federal Reserve Bank of Minneapolis indicated that, “The trend of falling farm incomes continued, but eased somewhat from the third quarter. Three-quarters of lenders said that farm income decreased in the fourth quarter compared with a year earlier, while only 3 percent reported increases.” (Fourth-Quarter 2016 Agricultural Credit Conditions Survey). Meanwhile, Donnelle Eller reported in The Des Moines Register on March 28th that, “Iowa farmland values inched nearly 1 percent higher the past six months, the first increase since September 2013, a new report says. The hike offers a glimmer of hope that the ag downturn could be hitting bottom. 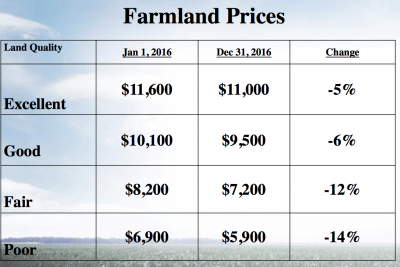 The Register article pointed out that, “Despite the slight improvement, farmland values are still 2.8 percent lower for the year, the group said, with values falling 3.7 percent from March 2016 to September. 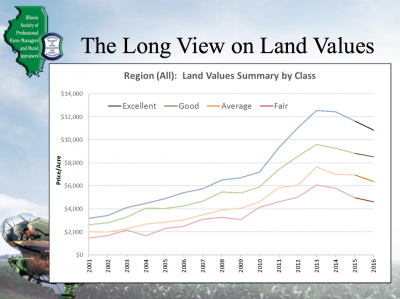 The price of excellent land in Illinois fell from $11,600 to $11,000, about a 5 percent drop from the previous year, according to the 2017 Farmland Values and Lease Trend report released March 23. 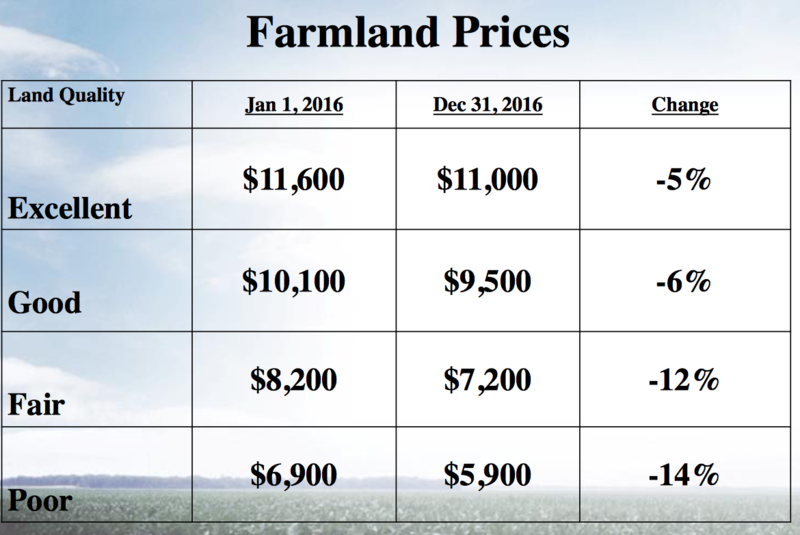 Illinois Farmland Prices, Table from, “2017 Illinois Farmland Values & Lease Trends” (Illinois Society of Professional Farm Managers and Rural Appraisers). The article noted that, “‘2017 could be a repeat of the last couple of years,’ Schnitkey said. However, he noted that respondents weren’t worried there would be a big drop in land values of 20 percent or more. “Rent and lease prices continued their downward trend. Cash rents for 2016 declined by roughly $25 per acre to a $325 average on excellent quality farmland. The survey showed landlords received $200 per acre for traditional crop share; $250 for cash rent and $235 for custom farming on excellent quality land. 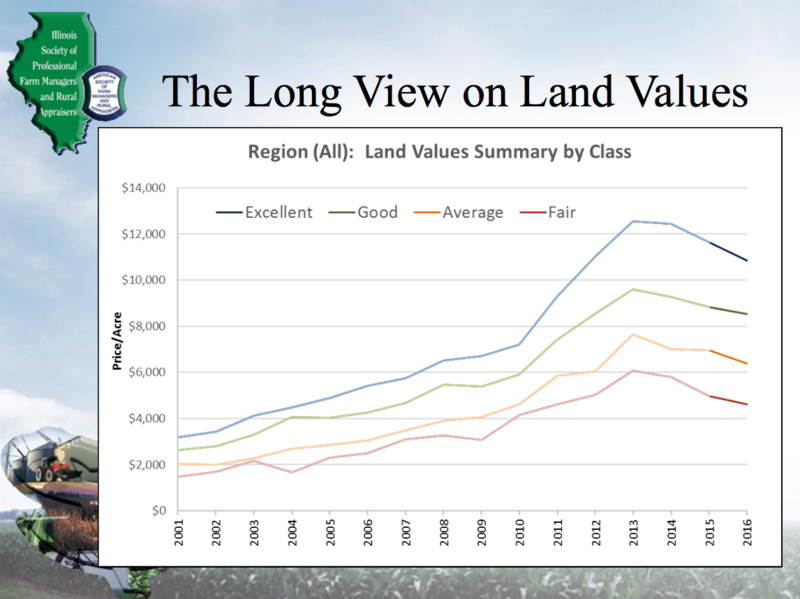 Illinois Farmland Prices, Graph from, “2017 Illinois Farmland Values & Lease Trends” (Illinois Society of Professional Farm Managers and Rural Appraisers). Looking ahead, Financial Times writer David Sheppard reported on March 28th that, “Some of the world’s biggest agricultural companies have said that key food markets are likely to remain oversupplied for at least three more years, in a likely boon for consumers facing higher inflation but a possible crimp on margins for growers, processors and traders. And Emiko Terazono reported on at The Financial Times Online on March 30 that, “World grain production is forecast to fall 3 per cent in the coming crop year as the record harvest in 2016 has taken its toll on corn and wheat prices, according the International Grains Council. “Despite the output decline, the high level of inventories is expected to keep grain markets well supplied. And Tom Meersman reported on the front page of the Minneapolis Star Tribune on March 29th that, “More than 30 percent of Minnesota farmers lost money in 2016, according to a new analysis by the University of Minnesota Extension and Minnesota State. “The average Minnesota farm’s balance sheets are still strong — mainly because of record corn and soybean yields and farmers banking some surplus dollars from a few years ago — but there are obvious signs of financial stress, said Extension Economist Dale Nordquist. Nordquist said there are always some farmers that struggle to stay in business, but the number in that category grew larger again last year. Graph from The Minneapolis Star Tribune, “Farmers in the Red Across the State.” March 29, 2017. The front page article added that, “Minnesota Corn Growers Association President Harold Wolle said that overall debt-to-asset ratios for most farmers are not a problem yet, but he acknowledged that ‘times are slimmer‘ because of the surplus of grain and continued low prices. On Tuesday, the House Appropriations Subcommittee on Agriculture held a hearing titled, "The Rural Economy." Today's updates provides a brief recap of some of the issues that were discussed at the Subcommittee meeting.